I was reluctant at first to purchase a mattress online without trying it out. But now, I am glad I decided to go with this mattress. I would recommend this mattress for someone who likes a semi firm mattress. I am happy with purchase! Slip into nirvana with the Simmons BeautySleep firm mattress set. 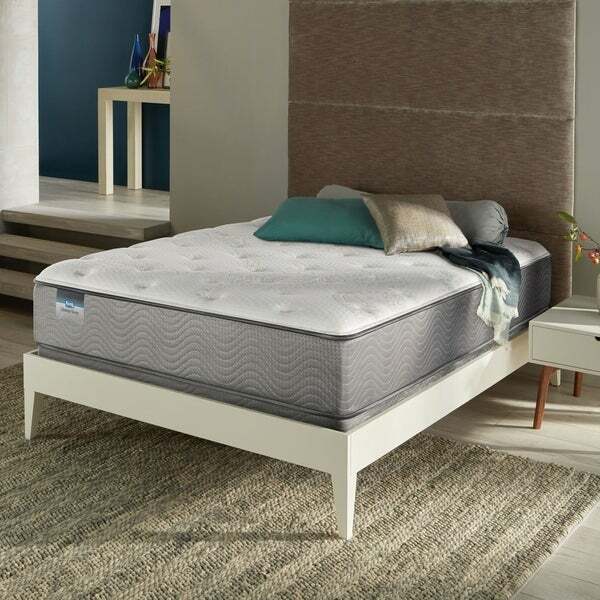 Available in sizes twin through California king, this mattress offers edge support to maximize sleeping area and helps regulate heat for a comfortable rest. I bought 2 sets of these for my girls and was nervous about buying a mattress on line but this did not disappoint. The mattress is sooo comfortable and they love it -with theperfect amount of softness and firmness . I only buy products that have a significant amount of reviews to help me decide when looking for a product. Since these mattresses are new it is difficult to know how they will wear but hopefully we will remain just as happy over time. Definitely recommend this product. Very comfortable to sleep on, very soft and contours nicely to the body. I was very hesitant to order a mattress set via internet. I decided to test some Simmons firm plush mattress sets in some local retail store first. After doing so I placed my overstock order. Delivery took a few weeks but it was worth the wait. I love this set, very computable with great nights sleep. This mattress set has great support. Had the best sleep ever! This was the best purchase I made with Overstock! I love resting on my new mattress set so much. My husband enjoys his sleep better too! So comfy !!! It’s like sleeping on a cloud and the price was incredible. I will be ordering another one for my guest room. Took awhile for delivery but not the fault of overstock. They use outside companies who set it up but since I live in an area kinda out of the way , they don’t deliver often. If you are near a major city , I’m sure it would come a lot quicker. I wasn’t in a rush though and the savings was well worth the wait !! This mattress is very sturdy and comfortable. My husband and I are both multi-position sleepers, and for years, my husband has claimed to need a FIRM mattress due to back problems. I have always preferred a softer sleeping surface, but since I don't have any back issues, we have always purchased FIRM mattresses, believing that was best for my husband's back. He continued to have back problems, and the only way for him to get a somewhat decent night's sleep was to sleep with an extra pillow between his legs. After having to sleep on several different firm mattresses (with no relief for my husband's back), I decided to start researching some PLUSH mattresses. After reading hundreds of reviews on several different PLUSH mattresses, I ended up choosing to purchase this mattress, and couldn't be happier. After the very first night, my husband said he "Slept like a baby" and no longer needs to sleep with a pillow between his legs to get a good nights sleep. He is waking up with less back pain, and I am loving being able to finally have my softer bed. It is nice and comfy and provides support no matter what position we're sleeping in. I highly recommend this mattress to any type of sleeper!!! Delivery status was 1-4 weeks, received mattress in less than 2 weeks. Had been searching for a reasonably priced good quality mattress and everything was so expensive and did NOT include the boxspring. I received an email from Overstock and decided to research what they had. The sales included the entire set. So Very pleasantly surprised the mattress and boxspring are great quality for such a reasonable price. My daughter loves her new bed. This mattress was very comfortable. I purchased this for our guest room but wouldn't hesitate to use it for my bed. I am very happy with this purchase and would recommend this to anyone shopping for a queen size mattress set. Great service, delivery, setup, and took away old mattress. Great bed. Very happy with it. Very comfortable! I would recommend this mattress to anyone. The mattress sleeps well; nice balance or firmness and cuddly comfort. It is a nice height with the regular profile base. I would suggest deep pocket sheets to get the sheet to lay the way I like. Also, I got a good deal with the Black Friday sale. It starts out great. We’ve had it for less than two months and it’s already sinking in quite a bit. The bed I’m told is comfortable but I’m knocking 2 stars off for the experience so far....I ordered this low profile bed for my 96 year old grandmother who due to medical issues and age has a difficult time getting up from her bed. She lives in a different state so I wasn’t there to receive the delivery in person. I’m so frustrated to find out that the wrong box frame was delivered. She doesn’t speak english and couldn’t tell them but someone along the way ( the process to get the bed from order to the warehouse to deliver took at least 3 weeks) should have seen and recognized that the box frame was almost half a foot longer than the mattress itself and was clearly not the matching counterpart. I called overstock today to help get this fixed so hopefully they will come through in remedying this quickly. I will post an update. "Says it doesn't need to be flipped, but can you flip it? The mattress I have now cannot be flipped, as the bottom side is different. It is hard. Also , what is the difference between low profile and regular profile? Thank you." The mattress cannot be flipped, it is one sided. The Low Profile has a 5 inch high profile and the Regular Profile has a 9 inch profile. "Does this come with box springs?" "Does this mattress come vacuum packed in a box? I need to be able to get the mattress to an upstairs bedroom." No, this mattress will not come in a box. "What does low profile and standard mean for this mattress?" Hello azwoman, thank you for your interest in this mattress set. The low profile set is going to be shorter. I have seen those sets mostly used on platform beds where a regular box spring would make the mattress to high. Here are the dimensions Mattress set dimensions: 21 inches high (17 inches high for low profile) X 76 inches wide X 79.5 inches long. Have a great day! "how firm is this mattress"
Hello skylar, the support for this mattress is "plush". Please let us know if you have additional questions. Thanks for shopping with us! "Is This Simmons Beauty Rest Stapelton A Flippable Mattress? Or Is It Extra Padded On 1 Side? It Says Plush Is It A Soft Mattress? Do You Sell Twin Xl Metal Bed Frame? " Hello RonGillhaus, this is not flip-able. Here are all of our twin XL bed frames http://www.overstock.com/Home-Garden/Bed-Frames/Twin-XL,/size,/22394/subcat.html Have a great day! Hello RonGillhaus, this is only the matched box spring, with no frame. Plush is a soft mattress. This mattress is not reversible. Thank you for shopping with us! just got a new bed, I use to have a queen now I got a king!